Sara Paretsky was born June 8, 1947, in Ames, Iowa, to David and Mary Paretsky, both of Jewish background. Sara grew up in rural northeast Kansas near Lawrence and graduated from the University of Kansas. 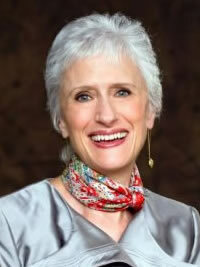 In 1968, Paretsky made the move to Chicago where she earned a Ph.D. in history from the University of Chicago. In 1976, Paretsky married Courtenay Wright, a widower with three children. Paretsky published her first novel, Indemnity Only, in 1982 which marked the first of many involving the female private investigator, V.I. Warshawski. Although best known for the Warshawski series, Paratsky has also penned two stand-alone novels and several short stories and essays. Sara Paretsky still lives in Chicago and continues to write, having released Breakdown in early 2012. I inherited my Italian mother's olive coloring, and tan beautifully. I grinned at myself. I could hear her saying, "Yes, Vic, you are pretty-but pretty is no good. Any girl can be pretty - but to take care of yourself you must have brains. And you must have a job, a profession. You must work." She had hoped I would be a singer and had trained me patiently; she certainly wouldn't have liked my being a detective. Nor would my father. He'd been a policeman himself, Polish in an Irish world. He'd never made it beyond sergeant, due partly to his lack of ambition, but also, I was sure, to his ancestry. But he'd expected great things of me..."
Jim saw himself as small, bewildered, holding out his hands in a futile effort to push back the funnels of wind. For a long time, he played that most useless of all games: if only. If only I had paid more attention to Chip, seen how unhappy he was. If only I hadn't argued so much with Susan about the bonfires or the war. If only I'd told John Fremantle no one could live in his parents' old home because it was too run-down. Sweat leaked down Hector's neck into his shirt collar, making him shiver in the warm night air. His warning had been the impulse of a moment; he still didn't know how he came to shout it out. He thought he'd felt Starr's presence when they came to the prairie grasses, some special fizziness in the air that made his blood race - although in his current state he couldn't tell the difference between desire and its object, and didn't know if he imagined the tingling in his blood or not. "Not everything about living in Kansas was difficult, but it was a difficult part of my life." The years spent in Kansas were tumultuous for Paretsky. Lawrence during the '50s and '60s was a tumultuous place because of racial and religious prejudice. The Jewish Paretskys relocated to a small farmhouse outside of town to escape these tensions when Sara was about nine. Unfortunately, rural Kansas failed to supply the family with any connection to the farmers in their midst. Home life also proved less than ideal. Paretsky's parents were in perpetual conflict and their attitudes toward women's roles in society placed Sara at a disadvantage early on. "I grew up in conservative rural Kansas in the 1950s when it was expected that girls would not have a life outside the home, so educating them was a waste of time." In many ways, Paretsky's experiences in Kansas were responsible for her moving to Chicago and becoming the writer that she is. V.I. Warshawski is largly a product of an escape from her former life and the limitations placed on her by her parents and rural society. Paretsky's 2008 novel, Bleeding Kansas, draws heavily on her experiences growing up, and serves as a means of coming to terms with the demons of her past.